Random Vegas - Over 43,000 people have jumpted off the 108th floor of the Stratosphere tower and fall 855 ft to the ground since the SkyJump attraction opened in April 2010. Two of those people are my wife and I. We have video on our YouTube channel of her jump. This weeks winner came to us from @karenbrandoles. 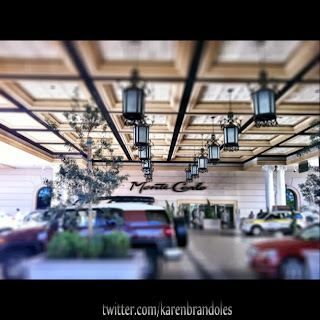 It is a unique look at the Monte Carlo Porte Cochere. I can't tell if this picture has been digitally altered or Karen is just an amazing photographer because the picture appears to only keep in focus what is beautiful about the Porte Coschere while blurring the things that make it cluttered and industrial.